notes: Made for 2011 BASCon, the Bay Area Slash Convention. summary: I'm getting old and I need something to rely on. Oh, simple thing where have you gone? And if you have a minute why don't we go? This vid makes me so damned happy. I love the interweaving of the cartoon, the words on the page, and then the "real" room and toys at the end, and where you chose to do the interweaving so it's not just a vid about storybook characters come to life, but a vid about imagination and stories. And nostalgia. It makes me happy and also it makes me sad. I love the idea of mixing the cartoon with the live action room because Winnie the Pooh has always been more than a story for me and others. This is AWESOME !!!!!! and I've been looking for more vids to show my 2 years old, and here it is ! Oh my god, this is gorgeous, and SO JOYOUS WHEN THE WORLD TURNED INTO HONEY. But I so wouldn't have picked it as yours out of a line-up! Where's the crazy, I ask you? I don't know how I vidded this. It's the height of my insanity. AHHH. NOSTALGIA. THIS VID...IT'S SO BEAUTIFUL. I used to call it Winnie Up To when I was kid, cuz I couldn't say it right. I have no idea. Haha. Awww, that is adorable. 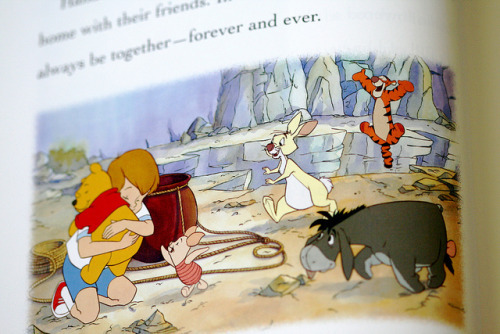 Winnie the Pooh is part of so many's childhood. This was really lovely, and adorable! Any chance you could re-upload this? I'd love a copy so I can watch it without the choppiness of streaming.